Turangi weather has settled now after lots of strong winds and rain. 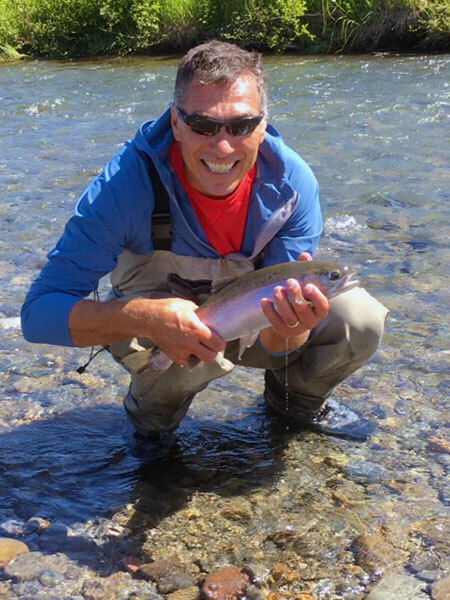 Nice sunny days will make for some great fly fishing as we climb up in our temp. Many May Flies are emerging and also the Green Manuka bettle has hatched as well, so dry fly fishing should be fantastic for the next few monthes. 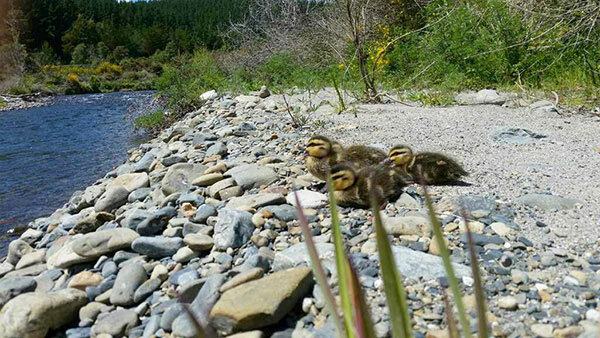 We have lots of trout in all river around Turangi at present. 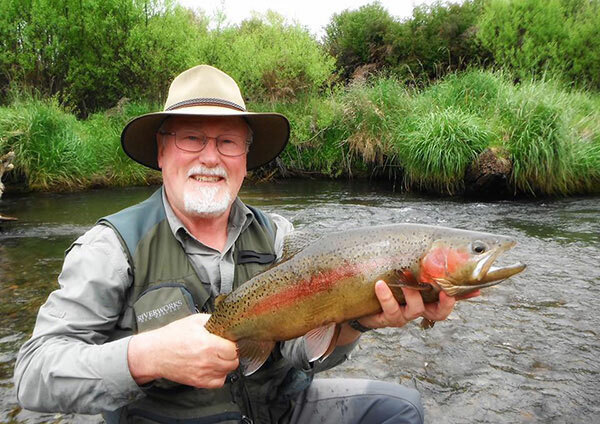 The Tongariro River continues to have some runs of fresh rainbow and Brown trout arriving from Lake Taupo. With the weather calming down, Lake Otamangakau should really fish well on the next sunny calm days. 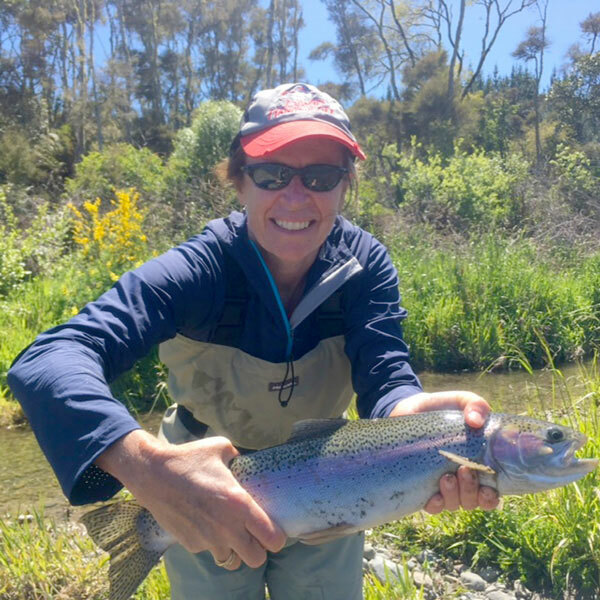 We found our first Cicada yesterday, so the fishing conditions for Turangi and the Taupo area are certainly looking good for some fantastic Fly Fishing this summer. 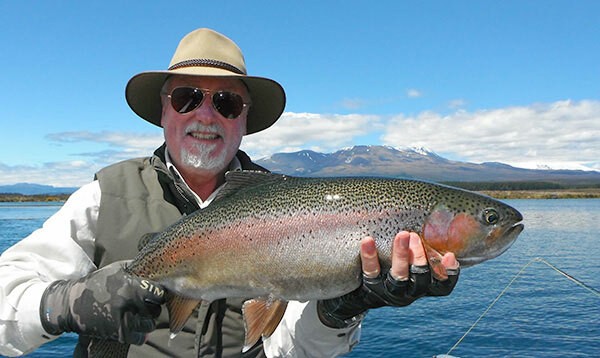 Lake Taupo is Fishing very good harling, trolling, lead lining, and jigging are all producing some nice eating fish. 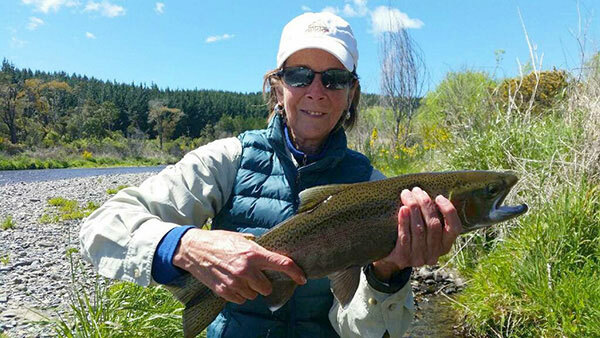 Don Boykiw and his wife from Canada stayed at the Creel Lodge in Turangi while on their Trout Fishing Vacation to New Zealand. They both caught some very nice condition trout from the Turangi rivers and in the Lake Taupo area. Hi Ken, thanks for a great day on the river. Your patience,, knowledge and enthusiasm for the sport was infectious! You know it is a good day on the river when you stop counting the fish that were caught! My wife and I have been touring NZ. 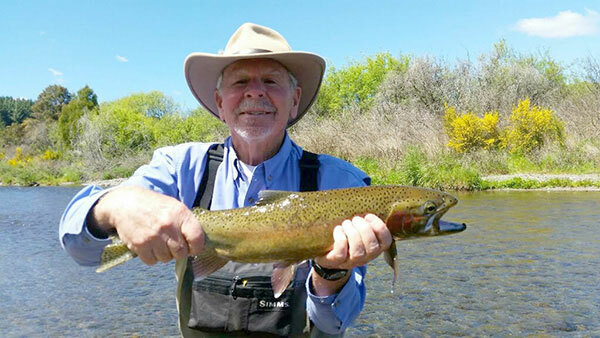 Before leaving Northern California, I booked two days in early November with Ken Drummond while staying at the Creel Lodge. During my 70 years, I have probably been guided 200 days with maybe 50 different guides, some great, some good, and some not so good. Ken is a great guide. 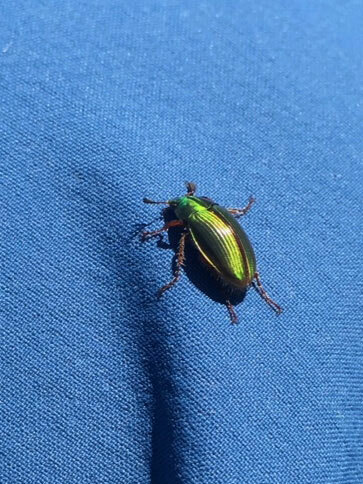 He has intimate knowledge of the waters and the bugs. As is often the case, we had semi-cooperative weather along with a fair amount of wind, Ken took all conditions into account in selecting the waters we fished and how we fished each water. 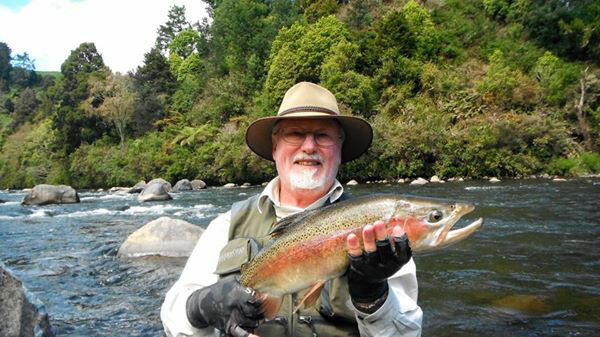 He has great respect for the Taupo-Turangi fishery and is a great river steward. It is reflected in the quality of the waters which he can access. It is a truly enjoyable experience to spend time with Ken. 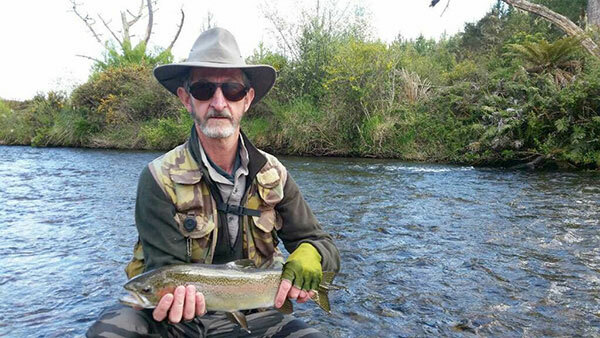 Juian Cribb from Australia trout fishing in Turangi with some fantastic condition rainbow trout. 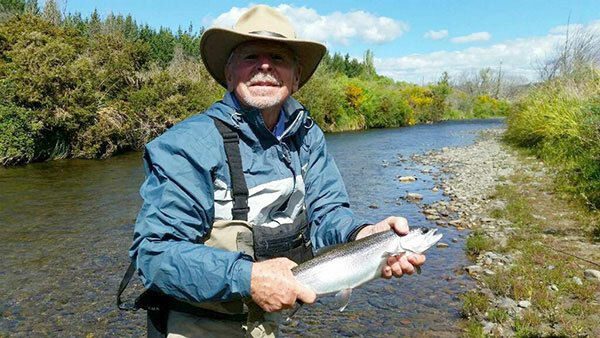 Julian Cribb fly fishing Lake Otamangakau holds a very large rainbow trout in excellent condition.